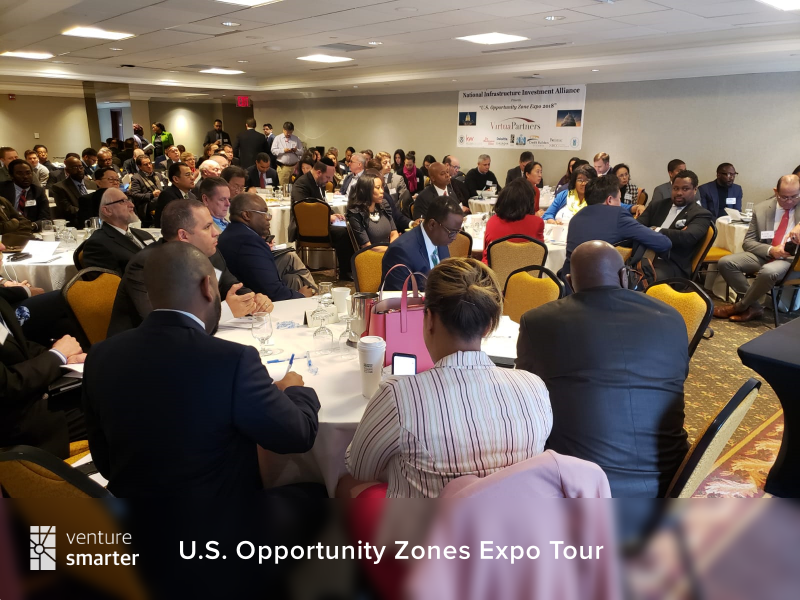 Venture Smarter and the Smart Regions Initiative partnered with the National Infrastructure Investment Alliance (NIIA) for the most recent installment of the Opportunity Zones Expo Tour in New York City. The Tour launched in D.C. last fall to expand awareness and ensure that the promise of December 2017 Tax Reform’s Opportunity Zone Program envisioned by Senator Scott and Senator Booker is fully realized. The high-level, standing room only gathering of investment and development leaders from the public and private sectors were bullish on the OZs program, and showed commitment to helping local governments secure financing and technical assistance for their priority public-private partnership infrastructure projects. Communities across the country are eager and on board. Mayor Oliver Gilbert of Miami Gardens, FL and current President of the African American Mayors Association showed passion for activating projects in his and so many cities around the country. This enthusiasm was matched by the federal, state and local officials as from Treasury, New York, New Jersey, Ohio, Atlanta, Los Angeles and the Town of Hempstead to name a few. Strategic Planning is Key. The experts discussed the importance and best practices around how to integrate projects into their existing environments for sustainable and organic growth and development. The OZs create a patchwork quilt that can match up and come together where the private sector wins, the government wins and communities flourish. In order to do so, they must work together to identify the real needs, empower local entrepreneurs and incorporate smart infrastructure. Brian Phillips, General Partner at The Pearl Fund is developing an Opportunity Zone + Venture Fund to do just that. Hearing To Be Scheduled Post-Shutdown. Dan Kowalski, Counselor to the U.S Secretary of Treasury Secretary Mnuchin and expert on Opportunity Zones outlined expectations around the rules and regulations. They are not fast and fixed. A final determination will be made following the yet to be scheduled hearing. Work with Treasury and Congress to establish a framework that provide guard rails to ensure that the OZ Program actually delivers positive community impact and job creation without quashing private investor appetite. The next installment will take place the first week of March in Houston, TX.